William A. Kelsey began making inexpensive presses for amateurs in 1872 as a calculated challenge to the three existing amateur presses: the Novelty, Cottage, and Lowe. Kelsey later made larger presses, but he became famous as the man who made printing presses for amateurs (preferably young, male amateurs, whom Kelsey targeted with extensive advertising in magazines for boys). James Moran writes, “Kelsey first advertised in 1872 before it was even known whether his newly built press would work. As it failed to do so there was naturally considerable embarrassment.” Kelsey did build an operational press; he named it the Excelsior, and it became the longest-lasting press on the market, continuing in production for almost one hundred and twenty years (from about 1873 until 1990) from Meriden, Connecticut, home of the Kelsey Press Company. The Excelsior evolved from a hand-inking trunnion form (1873; see Excelsior Trunnion), to toggle lever with optional foot lever (1874), to various self-inkers (1875; see related presses). The automatic inking system of the rotating disc was incorporated into the design in 1875 and did not change over the course of numerous stylistic alterations to the body of the press. 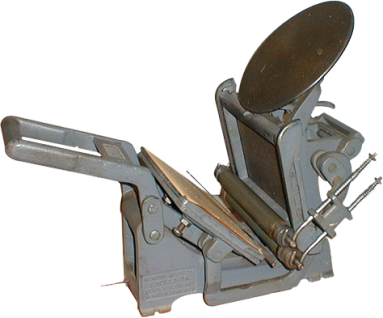 Another long-lasting feature of the early press was a chase with a closed bottom in the form of a tray to spare the amateur the frustrations of pied type. The hand-inkers were discontinued around 1893; the self-inkers took on a leaner look and a modified toggle in the 20th century. The company made some jobbing presses, and also the Star press, with less success. Kelsey’s success as a maker of presses for amateurs prompted others to imitate his line of small presses. Roughly twenty-five establishments in the United States were producing amateur presses between the years 1880 and 1910, but their numbers declined as Kelsey absorbed his competition. He bought out, among others, the businesses of B.O. Woods (maker of the Novelty), Joseph Watson (Young America), J. Cook and Company, and Curtis and Mitchell (Caxton). The Model P was one of the more popular and modern of the many Excelsior models. Some Kelsey presses of later manufacture can be dated by means of a serial number, located at the top of the chase bed. The initial letter designates the size of the press: A – 3×5; B – 5×8; C – 6×10. The numbers are the last two digits of the year of manufacture (in this case, 1951). The terminal letter designates the month of manufacture: A – January; B – February; C – March; D – April; E – May; F – June; G – July; H – August; I – September; J – October; K – November; L – December. There have been reports of occasional transposing of letters and numbers, such as the above being something like: 5B1G. An old Kelsey employee suggested1 that the reason may have been one too many ‘trips out the back door’!